This is a photograph of the premiere episode of Axel and His Dog. 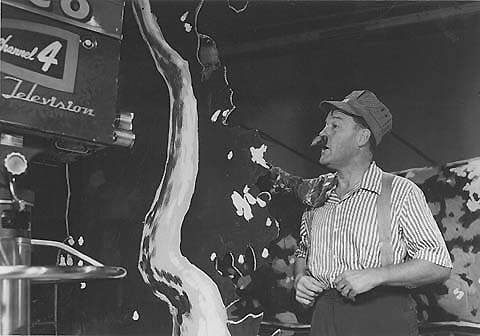 Don Stolz, who played Axel’s dog, Towser, is in the left foreground wearing the “paw” that was the only part of the mutt that viewers ever saw. Clellan Card as Axel appears to be speaking to the audience at home, as he often did. Notice that at first Axel wore a different style of shirt than the broad-striped one that later became so familiar to Minnesota baby boomers. Notice also that Axel’s spyglass is on the chair in the background, proving that Axel kept it in the Treehouse literally from Day One. 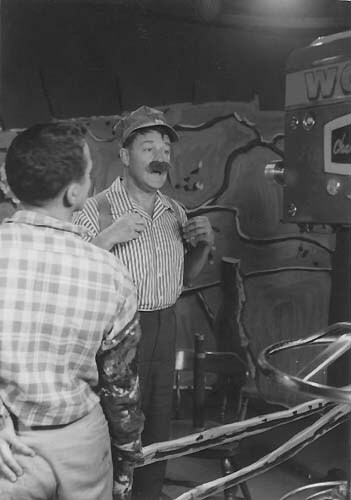 Here’s another photograph of the premiere episode of Axel and His Dog on August 5, 1954. Don Stolz is barely visible behind the foreground tree — which at this early date is different from the one that later became the focal point of the Tree House.